The Education for All goal and Millennium Development Goal of universal primary education by 2015 is the most prominent international goal in the field of education. Over the past years it has become increasingly apparent that the world will not reach this goal by the target year. New statistics, released by the UNESCO Institute for Statistics on 26 June, confirm that the number of out-of-school children has remained at nearly the same level since 2007. In 2012, the latest year with data, an estimated 58 million children of primary school age (typically between 6 and 11 years) were out of school, representing 9% of the global population in this age group. Between 2000 and 2007, the global number of out-of-school children fell from 100 million to 60 million in 2007, but since then there has been virtually no progress towards universal primary education (see Figure 1). 30 million out-of-school children, more than half of the global total in 2012, lived in sub-Saharan Africa. A further 10 million lived in South and West Asia, a reduction by more than two thirds from the 34 million out-of-school children in this region in 2000. 18 million children of primary school age were out of school in the remaining regions in 2012. Girls account for the majority (53%) of the global out-of-school population, mainly due to gender disparities in sub-Saharan Africa, where 13 million boys and nearly 17 million girls were not in school in 2012. 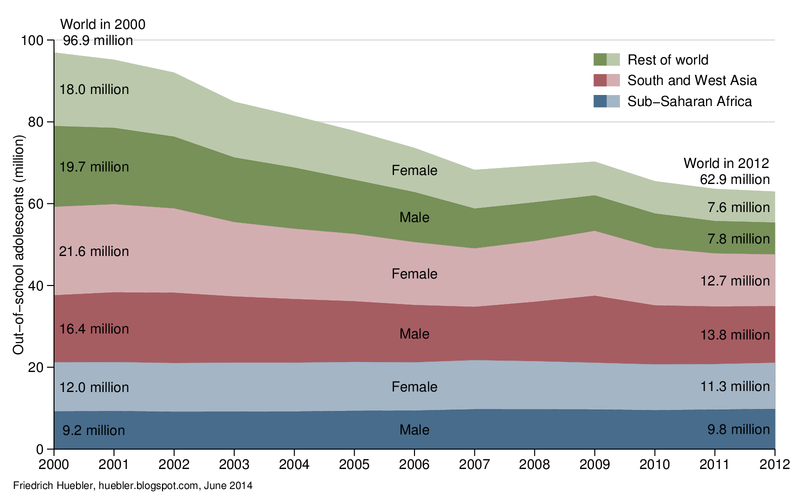 Data source: UNESCO Institute for Statistics, June 2014. In addition to the 58 million out-of-school children of primary school age, 63 million adolescents of lower secondary school age were not in school in 2012. This number is equivalent to 17% of the global population of lower secondary school age, typically between 12 and 15 years. In 2000, the global number of out-of-school adolescents was 97 million. Similar to the number of out-of-school children of primary school age, the number of out-of-school adolescents of lower secondary school age decreased steadily between 2000 and 2007, but since then progress has been much slower (see Figure 2). South and West Asia had the largest number of out-of-school adolescents in 2012, 26 million, followed by sub-Saharan Africa with 21 million and the rest of the world with 15 million. In contrast to the gender disparity observed among the out-of-school population of primary school age, the global population of out-of-school adolescents in 2012 was 50% male and 50% female. For additional information on out-of-school children and adolescents, read the policy paper Progress in getting all children to school stalls but some countries show the way forward, published jointly by the UNESCO Institute for Statistics and the Education for All Global Monitoring Report in June 2014. Universal primary education by 2015: A goal out of reach? The Education for All Global Monitoring Report 2013/4 was published by UNESCO on 29 January 2014. The title of this latest edition of the EFA GMR is Teaching and learning: Achieving quality for all. The report calls attention to the fact that none of the six Education for All goals will be achieved at the global level by the 2015 target year, including the goal of universal primary education (goal 2). Goal 1: Expanding and improving comprehensive early childhood care and education, especially for the most vulnerable and disadvantaged children. Goal 2: Ensuring that by 2015 all children, particularly girls, children in difficult circumstances and those belonging to ethnic minorities, have access to, and complete, free and compulsory primary education of good quality. Goal 3: Ensuring that the learning needs of all young people and adults are met through equitable access to appropriate learning and life-skills programmes. Goal 4: Achieving a 50 per cent improvement in levels of adult literacy by 2015, especially for women, and equitable access to basic and continuing education for all adults. Goal 5: Eliminating gender disparities in primary and secondary education by 2005, and achieving gender equality in education by 2015, with a focus on ensuring girls’ full and equal access to and achievement in basic education of good quality. Goal 6: Improving all aspects of the quality of education and ensuring excellence of all so that recognized and measurable learning outcomes are achieved by all, especially in literacy, numeracy and essential life skills. In addition to the tens of millions of children who remain excluded from education, millions more who attend school suffer from a poor quality of education. The EFA GMR 2013/4 emphasizes that teachers are the key to improving education quality and proposes several strategies to achieve good quality education for all. In Burkina Faso, the population aged 25 years and older had on average 0.9 years of education in 2007, less than any other country for which the UNESCO Institute for Statistics (UIS) released estimates of mean years of schooling in December 2013. The educational attainment of different age cohorts in Burkina Faso can also be examined with data from a Demographic and Health Survey (DHS) conducted in 2010. On average, persons aged 25 years and older in the DHS sample attended school for 1.4 years, slightly more than in the UIS data from 2007. The DHS data show a significant gender gap, with men having on average nearly twice as many years of schooling as women (1.9 years versus 1 year). However, the disparity between men and women in Burkina Faso is not nearly as large as the disparity between the urban and rural population. 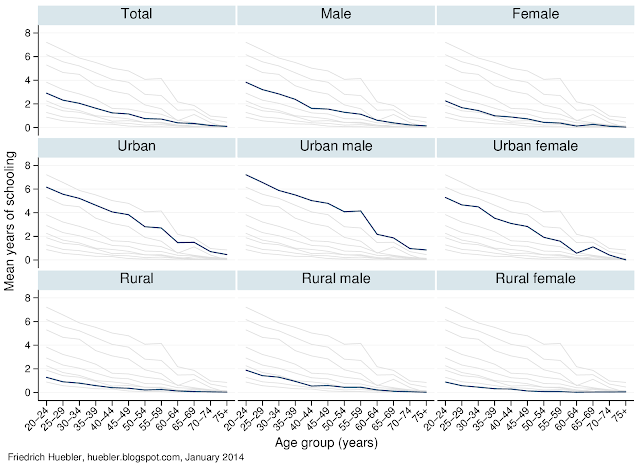 In urban areas, the average number of years of education is 4.1 years, compared to 0.5 years in rural areas. 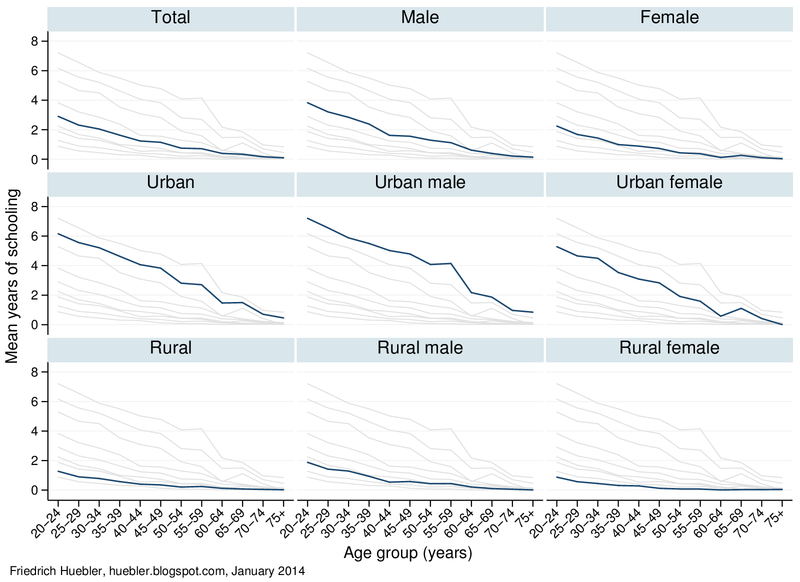 Urban women have 11 times as many years of schooling as rural women (3.3 years versus 0.3 years). For men, mean years of schooling is 5.0 in urban areas and 0.7 in rural areas. Source: Burkina Faso Demographic and Health Survey 2010. The DHS data can also be used to compare the educational attainment of different age groups. The figure below visualizes mean years of schooling by five-year age group, from persons aged 20-24 years to those aged 70-74 years and 75 years and older. The graph is divided into nine segments with data for the total, male and female population of Burkina Faso, as well as the total, male and female population of urban and rural areas of the country. The blue line in each segment indicates the mean years of schooling by age group for the respective population group. In addition, each segment of the graph shows the lines for the other eight segments in light gray to make it easier to compare the data for the different groups. One common feature across all population groups is that younger generations have more formal schooling than older generations, reflecting an expansion of access to education over time. In the total population, mean years of schooling increased from 0.1 years among those 75 years and older to 2.9 years among 20- to 24-year-olds. The biggest growth is observed among urban men: for this group, mean years of schooling is 0.8 years in the oldest cohort and 7.2 years among those aged 20-24 years. Rural women have traditionally been least likely to attend school but even here there is an upward trend: rural women 75 years and older have on average 0 years of schooling whereas rural women aged 20-24 years have on average 0.9 years of schooling. In conclusion, although the average level of education in Burkina Faso is very low, the situation is improving over time because children are more likely to attend school today than in previous decades. At the same time, the population of rural areas continues to be at a distinct disadvantage and lack of access to education is especially widespread among rural women.